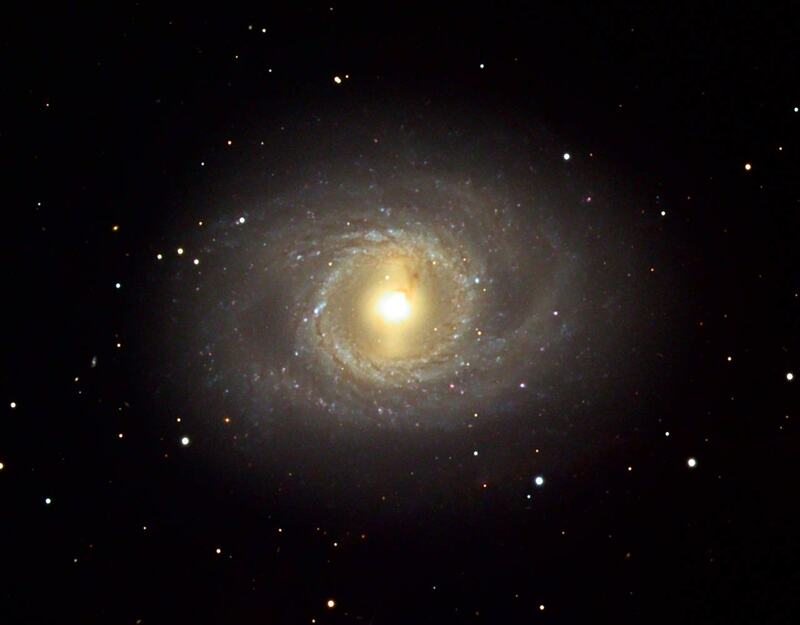 Messier 95 has the designation NGC 3351 in the New General Catalogue. It occupies an area of 3.1 by 2.9 arc minutes of apparent sky, which corresponds to a spatial extension of about 46,000 light years. With an apparent magnitude of 11.4, the galaxy is one of the fainter objects in the Messier Catalogue. In large binoculars, it only shows up as a hazy smudge, but it can easily be seen in small telescopes. 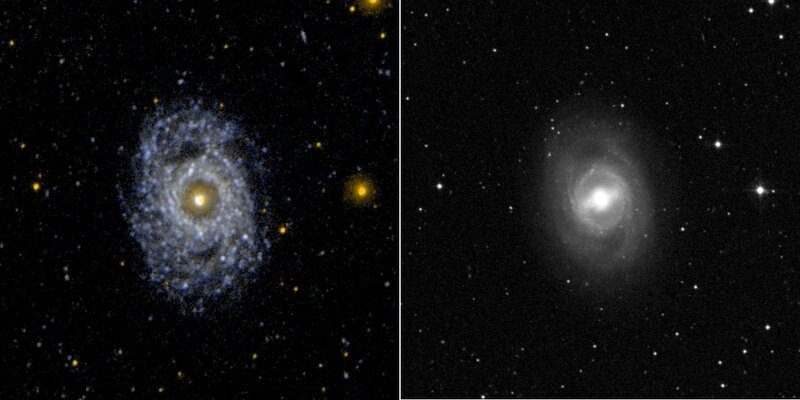 6-inch and 8-inch telescopes reveal a diffuse oval ball of light with a brighter centre, and the galaxy’s bar structure is only visible under exceptionally good conditions. 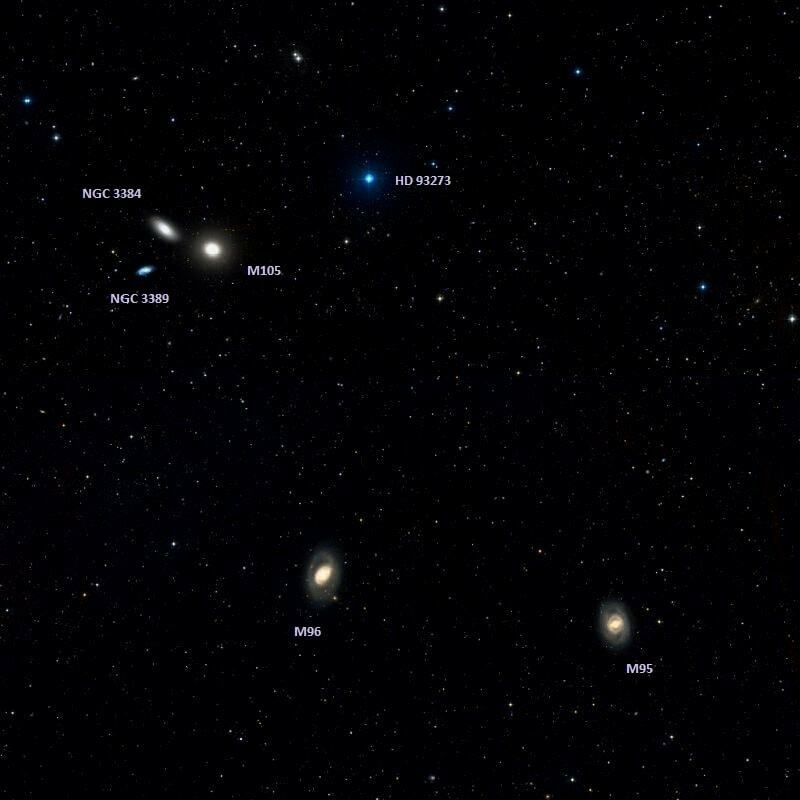 Messier 95, the nearby intermediate spiral galaxy M96, and the elliptical M105 can be found roughly a third of the way from Regulus, the brightest star in Leo, to Denebola, the third brightest star in the constellation, which lies about 24 degrees east of Regulus. M105 is the northernmost galaxy in the group and M96, the brightest of the three, is located 50 arc minutes south of M105. M95 lies 40 arc minutes to the west of M96. The best time of year to observe M95 and the nearby galaxies is during the spring. 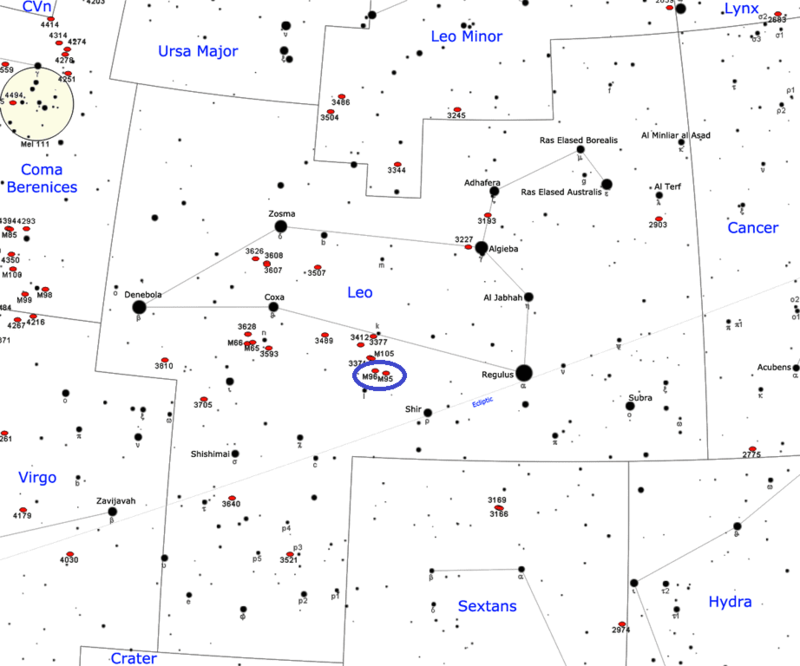 The Very Large Telescope has captured another member of the Leo I group of galaxies, in the constellation of Leo (The Lion). The galaxy Messier 95 stands boldly face-on, offering an ideal view of its spiral structure. 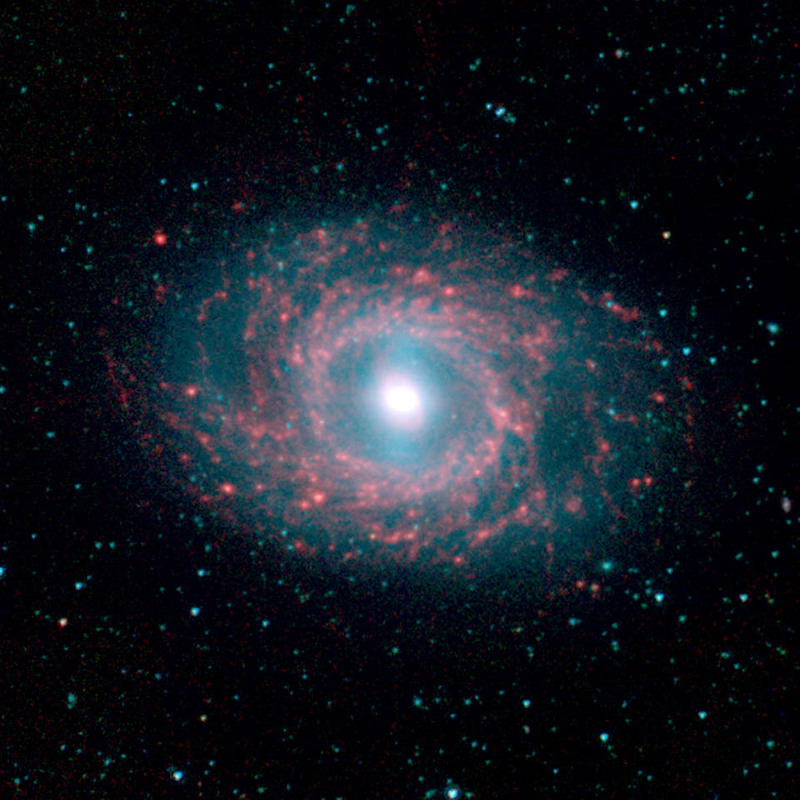 The spiral arms form an almost perfect circle around the galactic centre before they spread out, creating a mane-like effect of which any lion would be proud. Another, perhaps even more striking, feature of Messier 95 is its blazing golden core. It contains a nuclear star-forming ring, almost 2000 light-years across, where a large proportion of the galaxy’s star formation takes place. This phenomenon occurs mostly in barred spiral galaxies such as Messier 95 and our home, the Milky Way. Messier 95 is a member of the M96 Group, also known as the Leo I Group, a group of gravitationally bound galaxies within the Virgo Supercluster. The M96 Group also includes the Messier galaxies Messier 96 and Messier 105, and at least 21 fainter members. 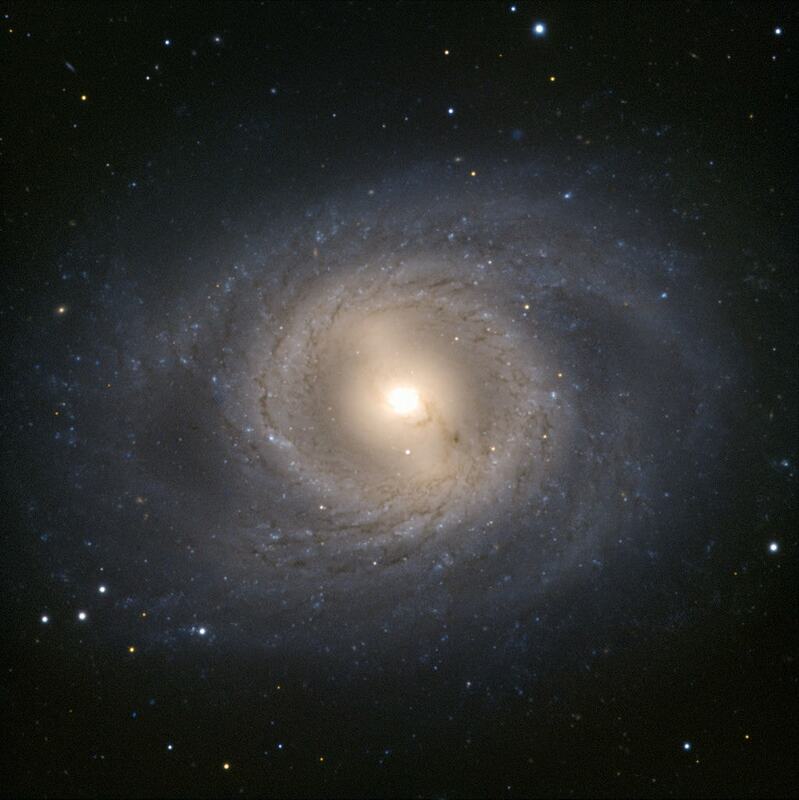 M96 is the brightest and largest member of the group, with a linear diameter of 80,000 light years, compared to M105’s 55,000 and M95’s 46,000 light years. 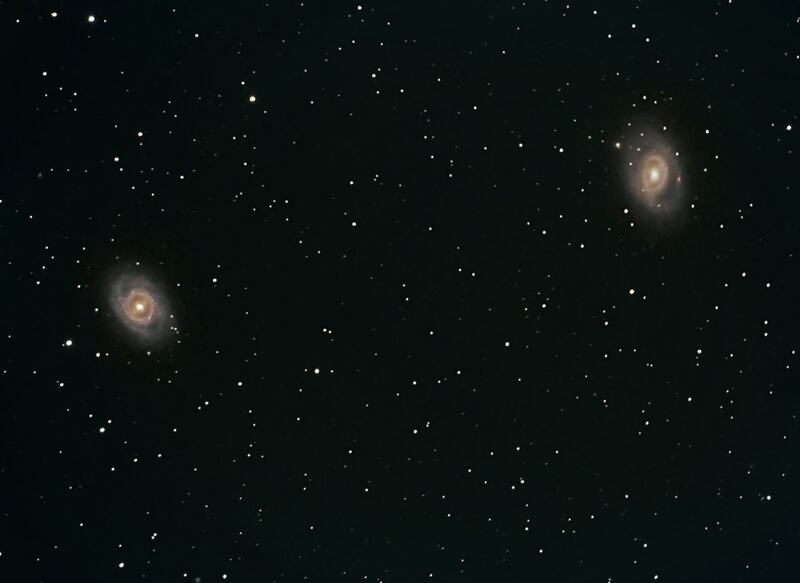 The galaxies in the Leo I Group will eventually merge to form a giant elliptical galaxy. M105, one of the last objects added to the Messier Catalogue, was not included by Messier himself, but by Helen Sawyer Hogg in 1947. Messier 95 is home to around 40 billion stars and has a well-defined spiral structure. It has nearly circular spiral arms and is classified as a type SBb or SB(r)b barred spiral. The galaxy’s central bar is surrounded by tightly wound spiral arms dotted by star forming regions, dust lanes and clusters of young, blue stars. M95 is receding from us at a velocity of 778 km/s. Messier 95 contains a ring-like circumnuclear star-forming region at its centre. The region has a diameter of 2,000 light years. The star formation within the ring is arranged in clumps, each about 60 to 85 parsecs in diameter. Each of the clumps contains compact young clusters of stars. The galaxy’s core is where most of the star forming activity is taking place. A supernova was observed 60 arc seconds west and 115 arc seconds south of M95’s centre, in one of the galaxy’s spiral arms, on March 16, 2012. At the time of discovery, the supernova had brightened to 15th magnitude. Designated as SN 2012aw, it was classified as a Type II supernova. It reached magnitude 13.1 on March 19, 2012 and peaked at magnitude 12.7, coming close to rivalling the whole galaxy in brightness. A fine, bright nebula, much brighter in the middle than at the extremes, of a pretty considerable extent, perhaps 3 or 4′ or more. The middle seems to be of the magnitude of 3 or 4 stars joined together, but not exactly round; from the brightest part of it there is a sudden transition to the nebulous part, so that I should call it cometic. This image of galaxy NGC 3351, located approximately 30 million light-years away in the constellation Leo was captured by the Spitzer Infrared Nearby Galaxy Survey (SINGS) Legacy Project using the telescope’s Infrared Array Camera (IRAC). The remarkable galaxy is graced with beautiful “rings” of star formation as seen at the longer (red) wavelengths, pierced by a massive bar-like stellar structure (blue light) that extends from the nucleus to the ringed disk. Nearly a degree to the eastward of this object, follows another round but not equally well defined nebula, large, and of a pale white colour. It is Messier’s No. 96, and was also discovered by Méchain in 1781; it constitutes the intersecting point of a rectangle formed by five stars, of which the nearest is in the sp [south preceding] quadrant, and of the 11th magnitude. A beautiful object; nearly round; 3′ in diameter. The whorls are rather faint and form an almost complete ring; a wide band of matter extends across the nebula from one side to the other; an example of the Phi-type [barred] spiral. The center is exceedingly bright, and of unusual structure. It is about 12″ in diameter, and appears trinuclear; the center of the disk is not marked by any condensation, but on its periphery has two stellar nuclei, and a short, very bright, slightly curved mass. 10 s.n.